Where have we lost the essence of being Nepali? Few weeks ago, my friend and I were hungry after a whole day of travel around New Delhi. We agreed that if we value our lives, we must show a little sympathy to our hungry stomach. Thus a desperate search for cheap food began. “McDonald’s?”, “Nah!” “KFC then?” “How’s that cheap?” “No Sir”. “Let’s just drink something first,” the dehydrated friend said. Our search led us to a nearby mall in Faridabad and we quickly found ourselves scanning the menu for more quantity in cheaper price. We finally came across a small shop around the corner where, for a while, we had a discussion on what to order. We asked the seller to bless us with the best drink he had to offer. Right then I heard a Nepali folksong playing in the background. I asked my friend if that’s really a ‘dohori’ or have I lost my mind. I wasn’t wrong and it was indeed a ‘dohori’ song. We looked at the shopkeeper. He smiled and asked, in Nepali, if we liked the drink and told us that he was happy to have us there. We were happy; naturally. It is always pleasant finding someone you can identify with when there is no one around who resonates with your way of life. We exchanged few words and I realized it was getting late for me to reach my hostel. We finished up our drink, it was nearly 7pm and we went to the counter to make our payment and something captivating happened. We had seen the menu. The drink was 130 rupees. As I opened my purse the shopkeeper asked us only 100 rupees. I couldn’t process what was happening. I, however, insisted that he should charge us fair and square. But he said, “It is not every day that people from our country visit my shop, it is uncomfortably rare.” He also added that he would be ashamed of himself if he failed to treat us nicely. His words consumed me, I felt happy. All three of us looked at each other and we just stood there smiling, for a moment. We bid him farewell and marched down the road that would take me back to my hostel. As I read newspapers these days, I wonder where we have lost the essence of togetherness. Everyone is so consumed with hatred that we have lost the sense of satisfaction and comfort that togetherness has to offer. We hurt our own. We have picked up on the habit of differentiating ourselves in this journey towards ‘development’. If development means distance, I’d rather sleep under the stars all my life. The shopkeeper is from a village in Mugu, my friend is a Madhesi, and I am from the hills. I wondered that day: If we can have that outside, what went wrong inside? 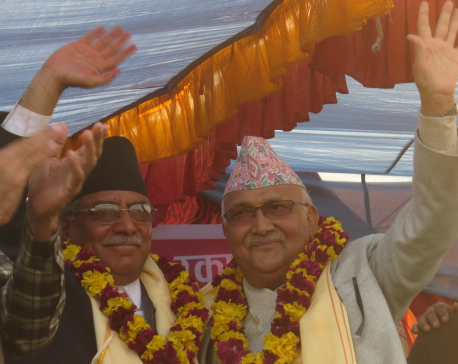 At Badarmude, can Dahal win where families were lost? LONDON, August 20: Singer Louis Tomlinson says being a solo artist is harder than being in the band One Direction.